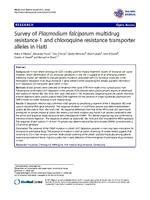 Background: In Haiti where chloroquine (CQ) is widely used for malaria treatment, reports of resistance are scarce. However, recent identification of CQ resistance genotypes in one site is suggestive of an emerging problem. Additional studies are needed to evaluate genetic mutations associated with CQ resistance, especially in the Plasmodium falciparum multi-drug resistance-1 gene (pfmdr1) while expanding the already available information on P. falciparum CQ transporter gene (pfcrt) in Haiti. Methods: Blood samples were collected on Whatman filter cards (FTA) from eight clinics spread across Haiti. Following the confirmation of P. falciparum in the samples, PCR protocols were used to amplify regions of pfmdr1and pfcrt codons of interest, (86, 184, 1034, 1042, and 1246) and (72-76), respectively. Sequencing and site-specific restriction enzyme digestions were used to analyse these DNA fragments for the presence of single nucleotide polymorphisms (SNPs) known to confer resistance to anti-malarial drugs. Results: P. falciparum infection was confirmed in160 samples by amplifying a segment of the P. falciparum 18S small subunit ribosomal RNA gene (pfssurrna). The sequence of pfmdr1 in 54 of these samples was determined between codons 86,184 codons 1034, 1042 and 1246. No sequence differences from that of the NF54 clone 3D7 were found among the 54 samples except at codon 184, where a non-silent mutation was found in all samples predicted to alter the amino acid sequence replacing tyrosine with phenylalanine (Y184F). This altered sequence was also confirmed by restriction enzyme digestion. The sequence of pfmdr1 at codons 86, 184, 1034 and 1042 encoded the NFSN haplotype. The sequence of pfcrt codons 72-76 from 79 samples was determined and found to encode CVMNK, consistent with a CQ sensitive genotype. Conclusion: The presence of the Y184F mutation in pfmdr1 of P. falciparum parasites in Haiti may have implications for resistance to antimalarial drugs. The absence of mutation in pfcrt at codon 76 among 79 isolates tested suggests that sensitivity to CQ in Haiti remains common. Wide-spread screening of the pfmdr1 and pfcrt especially among patients experiencing treatment failure may be a useful tool in early detection of the emergence of antimalarial drug resistance in Haiti.